It was 2 a.m. We were driving up the mountain on a motorbike, rushing via serpentine roads of East Java. Not many cars were passing by at this time of the night, at this coordinates of the world. Sitting behind my driver John, I was holding tight while the night rain and wind slapped at every curve. Dressed in the golden rain gear, and with a helmet on my head, I felt like an astronaut about to launch into a deep space adventure. In just a few hours I will be standing on the edge of the Kawah Ijen Volcano, probably one of the most extraterrestrial looking places I have ever visited. My trip started with a day-long ride from Yogyakarta to Banyuwangi. Any train seat will get uncomfortable after 13 hours of use. The food in the train was quite disappointing, some tasteless rice and chicken. There was not much to do, besides trying to get to know your fellow passengers. Harfa, a 19-year-old, was quite talkative. He really, really wanted to know how old I am. Encouraged by the fact that Indonesians never managed to get the right number from reading my face, I accepted the bet. And Harfa got it! I had to say goodbye to 10.000 Rupiahs that day. That young guy, who has barely seen the world, and even less white people in it, read my age like an open book! I will bump into Harfa again two days later, at Kawah Ijen Volcano, on the most populous island in the world! What are the odds for that? Still, our mysterious pathway crossing will be overshadowed by one of Earth’s most beautiful spectacles, older than Harfa and me together. 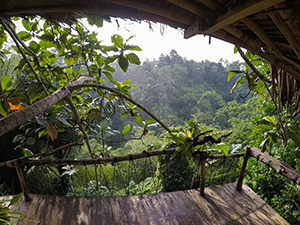 Imagine waking up in a tree house overlooking the jungle! Priceless! As climbing to Kawah Ijen Volcano is typically a nighttime activity, I decided to arrive in Banyuwangi the night before so that I can get proper rest. Especially after that train ride. I have chosen to stay at Ijen Shelter, a brand new accommodation facility that offers staying in the – tree house! This will be another of “my firsts”. Tree houses embody both the fantasy and return to nature, so I was really looking forward to sleeping on the tree. It was getting late when I arrived, but Daniela, a German expat in Banyuwangi and co-owner of the shelter, still offered me a tasty Nasi Goreng wrapped in banana leaf and served in bamboo. Then she escorted me to the tree house. As it was pitch dark, I just followed her nightlamp, trying not to slip on the wet ground. The full magnificence of the place did not get me before the morning, when the songs of the birds, and clamor of the monkeys in the distance, woke me up. Surrounded by jungle, Ijen Shelter was providing an authentic getaway. I already felt sad that, after two nights, I will need to leave this perfect hiding place from the civilization. After breakfast (delicious fried bananas with cheese and chocolate), Daniela showed me the neighboring villages. It was surprising to discover quite a lot of sculptures and art installations in what seemed to be a rural environment and was inviting for more in-depth exploration. But my primary focus for this visit was Kawah Ijen Volcano, a fantastic installation copyrighted by nature. 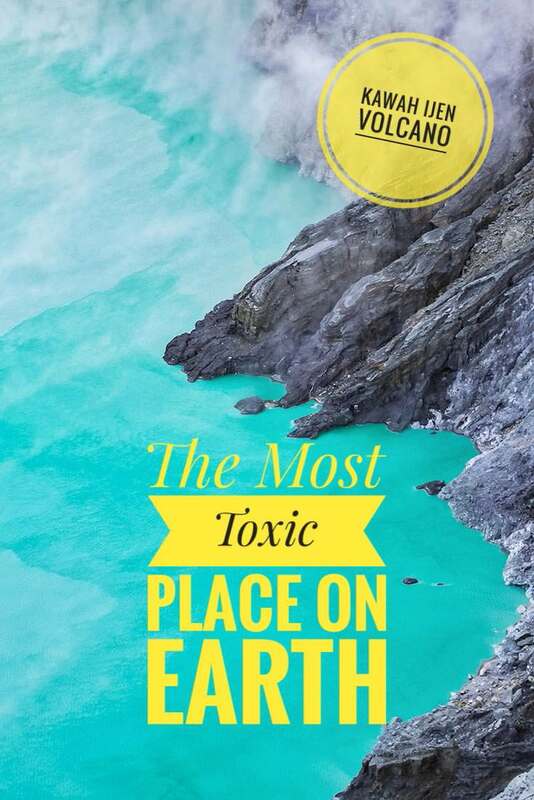 I have already read about the blue fire, the acidic lake, the amazing sunrises. But no reading could affect the feeling of an ultimate surprise that live encounter with Ijen provides. 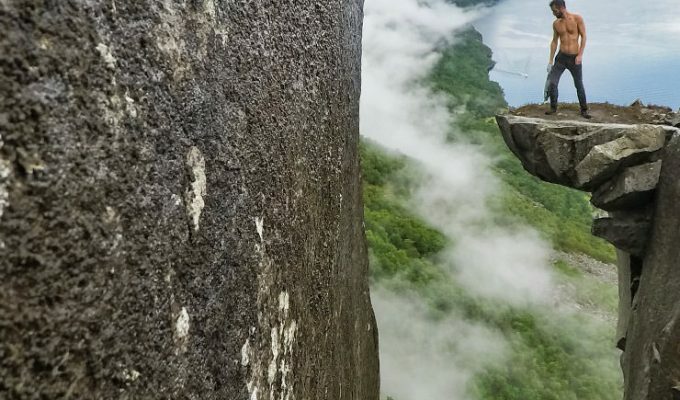 Even if there are possibilities to visit the most toxic place in the world with a guided tour, I have decided to do the climb by myself. I have never hiked a volcano before, but I think that advancing in fear management is beneficial for any aspiring traveler. Daniela lent me her golden rain gear and a headlamp, and I felt scared and ready simultaneously. John drove me to the entry point on the foot of the volcano, I purchased the ticket and the gas mask and started walking. 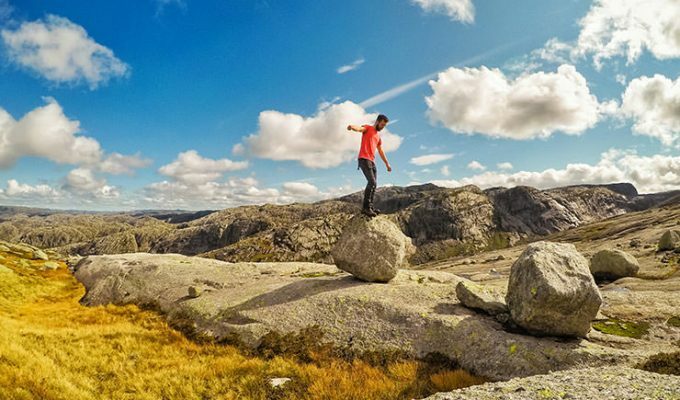 If you are interested in another kind of risque hiking, read an interview with Erik, the Australian hiker that enjoys the nature in the most natural state. In the darkness, some miners were waiting along the path, offering a taxi ride to the top. Later on the hiking path, I’ve encountered three Indonesian miners, pulling the cart with a morbidly obese tourist up the mountain. Their wages are minimal, and this image engraved in my mind as an example of degradation through exploitation. 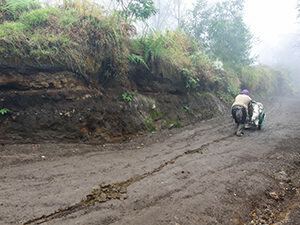 Miner’s job at Kawah Ijen Volcano is a heavy one – just look at the trail the heavy cart is leaving behind! These miners already have one of the hardest jobs in the world. 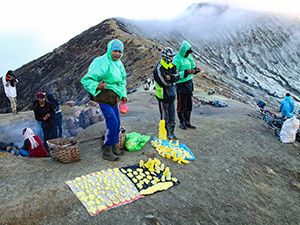 Excavating chunks of sulfur, while toxic gases pour out of the vents, bringing the baskets with up to 90 kilograms heavy loads to the crater rim and then three kilometers down the steep trail to the weighing station, provides them about 13 dollars a day. They are not using gas masks while working. When I was climbing up the volcano, the distinctive miners’ coughs were ripping the silence that encircles this active volcano. No smoker sounds like that. Due to respiratory afflictions, their life expectancy is 50 years. After 1,5 hour climb (it might be 2, if you go more slowly, or less if you are really speedy), I’ve arrived at the viewpoint where several dozens of tourists were already standing and observing several blue fire flames playing on the volcano surface. Hot sulfurous gases are highly flammable and ignite when getting in touch with oxygen, burning with an electric blue flame. Flames are there actually all the time, but only visible at night. Sometimes. That evening the weather conditions were not perfect, so blue-flames promise might have been a disappointment for some. I sat behind one rock, trying to warm myself up. Speed walking towards the top made me sweat, and I was shivering in the absence of an additional shirt. To be honest, I sat down thinking that all of us are waiting for the blue flames to happen, while the flames have already reached their visibility peak. Rising sun was erasing them completely. 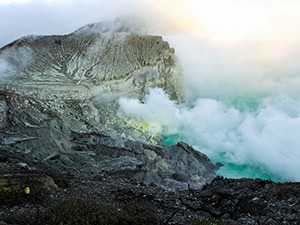 While I was observing the beautiful sunrise, behind my back, Kawah Ijen was quickly stripping off its cloudy clothes. In a matter of seconds, white clouds climbed over the crater rim, revealing the surreal, turquoise blue crater lake. That was indeed deus ex machina. Literally, it appeared out of the blue. 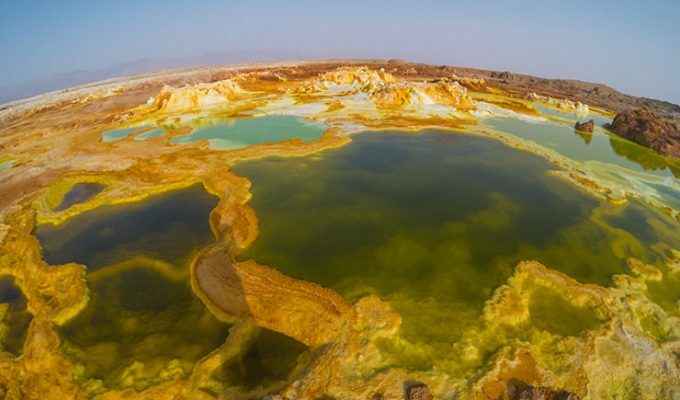 One kilometer in width, this is the largest highly acidic lake in the world! On the PH scale from 0 to 14, this lake is 0.13! No life exists close to this waters. On the day of my visit, the concentration of gases was extremely dangerous. Even if I put on a gas mask, descending the crater towards the lake was forbidden. If you are lucky (or if you are a miner who chooses to die sooner), you might experience the privilege of taking a look at this unique site from proximity. Before heading back, I bought several figurines made of sulfur. These miners have enough troubles with wearing heavy loads or sulfur and fat tourists up and down the volcano. Figurines shaped like Donald Duck, Hello Kitty or simple flower might not have a particularly smart use, but they are probably a nice souvenir of appreciation for one of the hardest jobs in the world. Going down Kawah Ijen Volcano in broad daylight revealed some stunning views of the natural environment, as well as scary cliffs one passes more easily during the night. One starts to think whether hiking an active volcano was a risk worth taking. Miners don’t have time to reflect on that. Destiny wanted that I meet Harfa again when descending the volcano. This young gambler successfully guessed my age on the train. I lost only 10.000 Rupiahs in the bet. 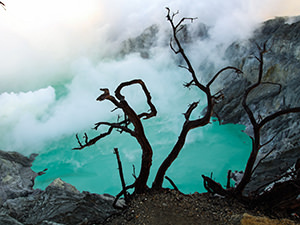 Kawah Ijen Volcano miners gamble with age with much higher stakes and more apparent sad outcome. At the bottom of the trek, John was waiting for me. Delicious Nasi Goreng with chicken and pineapple for breakfast at Pondok Indah restaurant. I hope that miners’ families also get a proper meal thanks to the sacrifice of their working men. 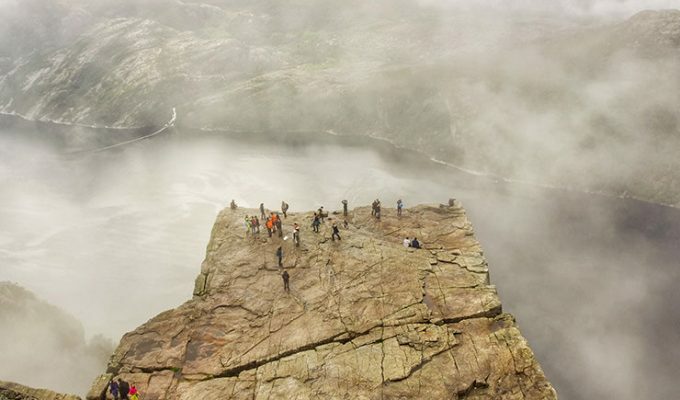 What was the most dangerous place you have visited? 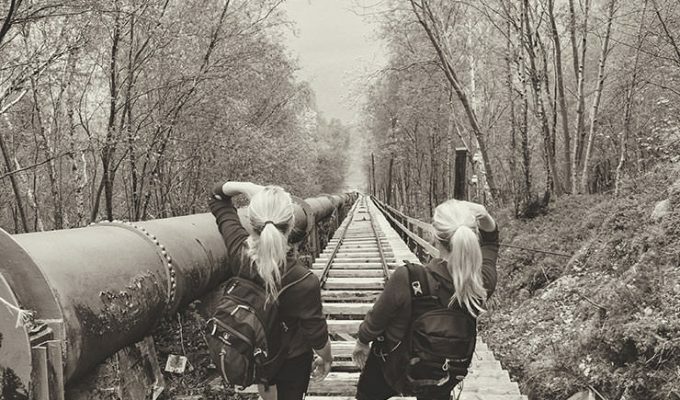 I am looking for some travel inspiration! Feel free to share your ideas and recommendations in the comment section below! This was an incredible read! I’ve heard of the volcanoes blue flames but didn’t know much else about it. The writing is l descriptive and insightful and I love the points you made about buying a souvenir and the miners gambling with their lives. Thanks for telling their story. Thanks, Yvette! I am glad you found it useful and important! Especially about the miners. The world is full of underpaid jobs that enable the Western civilization to live the life they define as standard. And at the same time the West is not doing much about standards of people who are practically enslaved to make this possible. Your photos are beautiful! I cant imagine going to such a dangerous place, but those miners do it all the time! Great post! Thanks a lot! I am glad you like the pics! Danger is relevant, I guess. No big harm from one visit, but very rewarding. 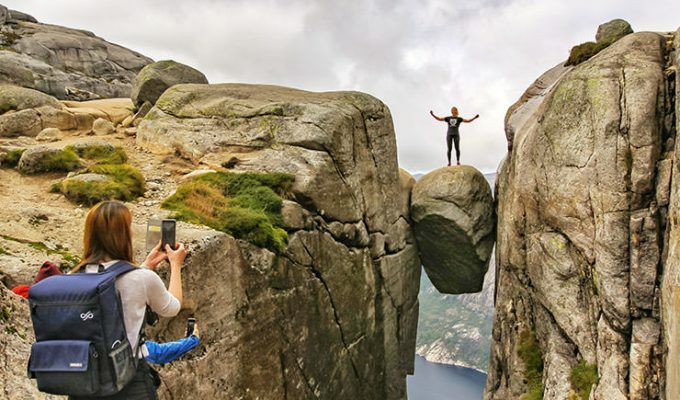 This place looks so fascinating! I’m definitely adding it to my list of places to visit in Indonesia!